35+ Adorable Tissue Paper Crafts To Try With Your Kids! These 35+ Adorable Tissue Paper Crafts are sure to put you in a crafting mood! We love tissue paper crafts and if you’re anything like us, then you have lots of scrap tissue paper hanging around your home too. Check out our great list of tissue paper crafting ideas for you to try today. We’ve included a wide age range so there is something for the littlest crafters all the way to the older kids. This tissue paper painted canvas from Fiskars is so cool that I’m making it with my own kids! 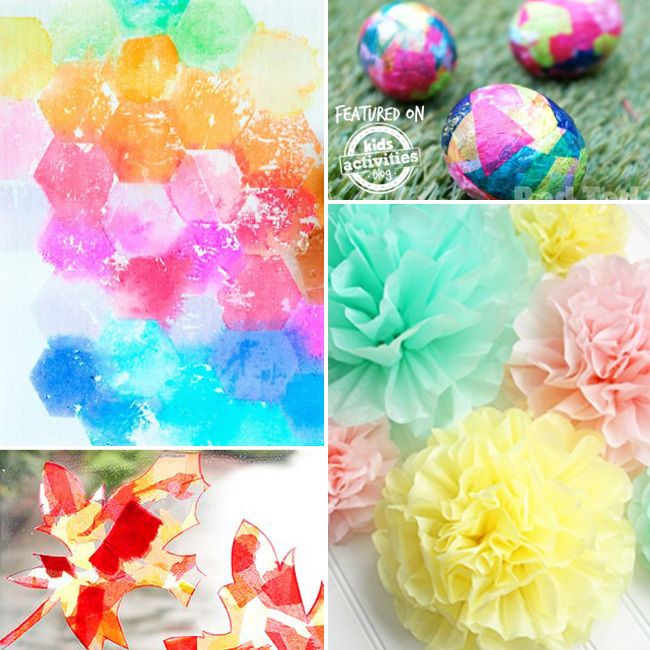 i Creative Ideas’ beautiful tissue paper flowers are fun for kids to make and display at home. 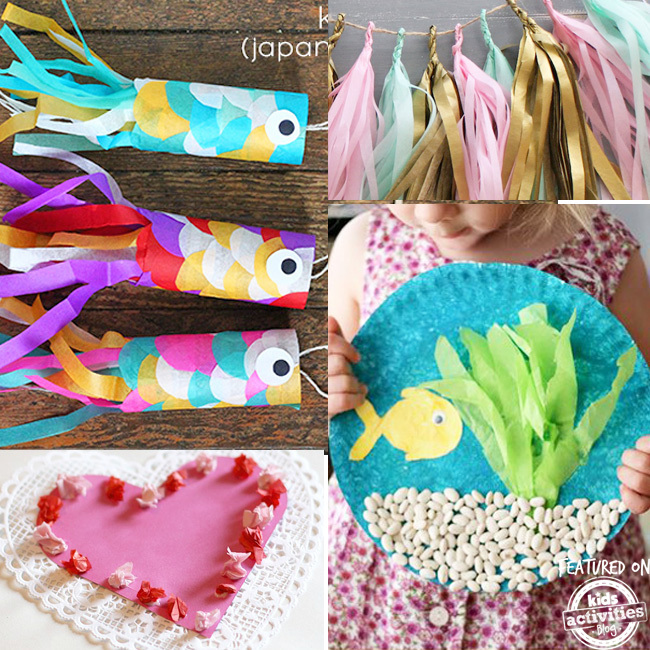 Kids will have so much fun making flying fish! Check out this Japanese Flying Carp craft from Squirrelly Minds. Younger kids can easily make this tissue paper flower art craft from Mess for Less. There’s even a free printable included! Here’s a cute tissue paper ladybug kids craft with a free pattern to try, from I Heart Crafty Things. Readers will love making this stained glass bookmark from First Palette. 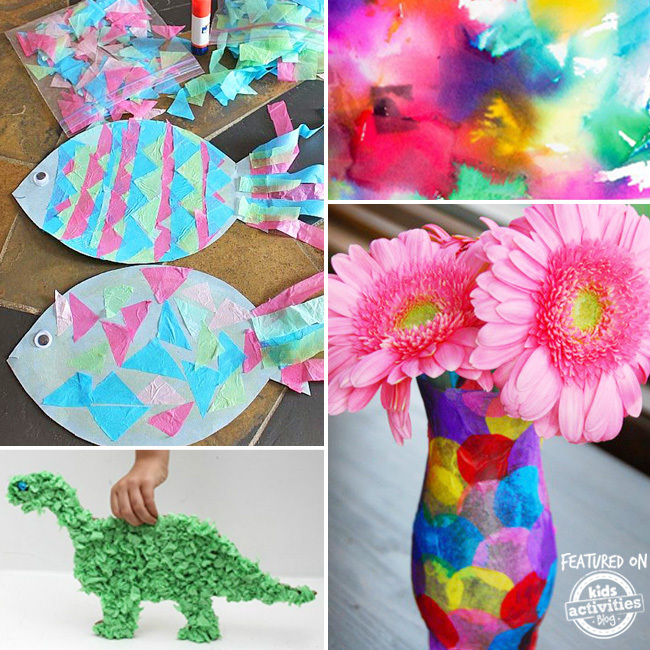 What a great tissue paper craft for kids. Learn How to Craft With Tissue Paper By Watching This Video! Life with Moore Babies shows us this gorgeous front door covered in tissue paper that looks just like stained glass! More Tissue Paper Crafts Below! Tissue Paper Crafts That Kids Will Love! Use tissue paper for leaves on this amazing tree craft from Fantastic Fun Learning. All you need is a paper plate, construction paper, and tissue paper to make this adorable pineapple tissue paper craft from Glued to My Crafts. Here’s another pineapple tissue paper craft from, Molly Makes, that is so cool! Roar! Here’s a fun dinosaur tissue paper craft for kids to make, from Mom Unleashed. Your kids will want to make I Heart Crafty Things‘ Yarn Wrapped Blossoming Spring Tree. Let’s make ice cream tissue paper crafts with this sweet idea from Glued to My Crafts. Using this free printable from Meaningful Mama you can make a globe from a paper plate and tissue paper! Crafting With Tissue Paper Is So Much Fun! These Eric Carle inspired eggs from Red Ted Art are so pretty! Perfect for Easter or just a fun art project. It’s easy to make this glowing Halloween pumpkin from Love + Marriage and a Baby Carriage. Just glue tissue paper to a mason jar! Make a festive holiday wreath with tissue paper and a paper plate, with this adorable idea from There’s Just One Mommy. Change the colors to fit any occasion! This one is a little more complicated, but these tissue paper leis, from What I Do, would be the perfect tissue paper craft for older kids. You’ll love helping your preschooler make The Resourceful Mama‘s tissue paper rainbow craft. Here’s a great tutorial on how to make tissue paper pom poms, from Two Twenty One. Create a shiny piece of art with this aluminum foil and tissue paper collage. Help learn the letter F with this flower craft from Toddling in the Fast Lane, including construction paper and tissue paper. Let the rules go, and just let them take their favorite colors, and create a tissue paper collage with this pretty and fun craft from Where Imagination Grows. One Little Project‘s fire breathing dragon makes such a fun tissue paper craft! Buggy and Buddy shows us a fun valentine invitation to create with tissue paper, glue, crayons, and a paper doily. Use Mod Podge and tissue paper circles to upcycle a plain glass vase with this gorgeously creative idea from Meaningful Mama! Based on the book The Kissing Hand, make a tissue paper hand sun catcher making the I love you sign, with this sweet idea from Fantastic Fun Learning. 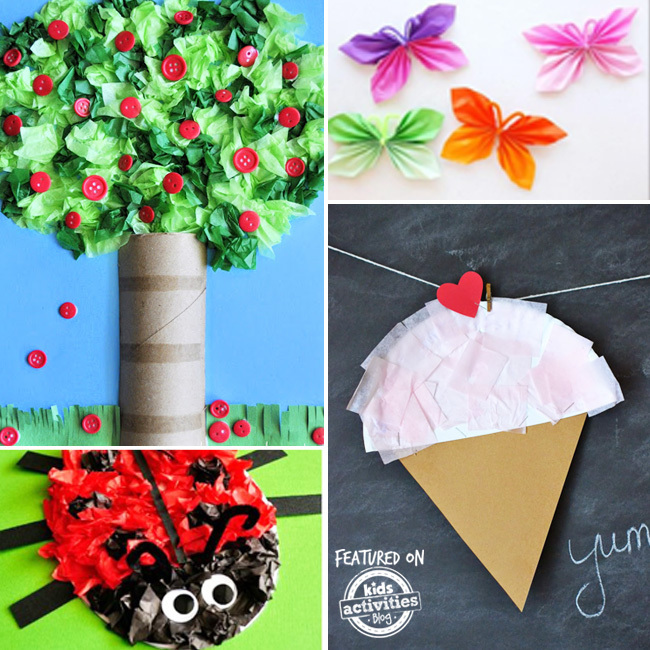 Kids will love creating their own tissue paper apple tree, from I Heart Crafty Things. Use tissue paper to wrap a soap box, and make a miniature box of chocolates perfect for Valentines Day! What is your favorite craft to make with tissue paper? Comment below! Thanks so much for sharing my ideas here. What a great group of tissue paper crafts. Just FYI too, I just tried to share on Google+ with one of your buttons and neither of them work on my end. I see there are no shares, so it might be an issue. Could just be a glitch on my end too, but I thought I’d let you know. Great round up of ideas! I have bunch more to add to my list now! 🙂 Thanks for including our tissue paper collages! Very creartive papaer tissues I will propose to my daugther.Thanks a lot for these ideas are very useful for children and preschool.